Well, I set my new personal record on Friday, for worst gig I’ve ever performed at. 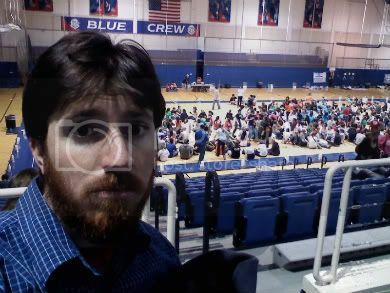 I was asked to perform in an “auditorium” for “500 students” at American University. It was a Relay for Life benefit for the American Cancer Society, and they offered me $150. Okay, so good cause, good university, auditorium with 500 students, and I’m open that night, sounds good! When I arrived, the “auditorium” was Bender Arena, which is a gym, not an auditorium. Critical difference between the two – the primary difference being, auditorium’s have stages, while gym’s have basketball courts. 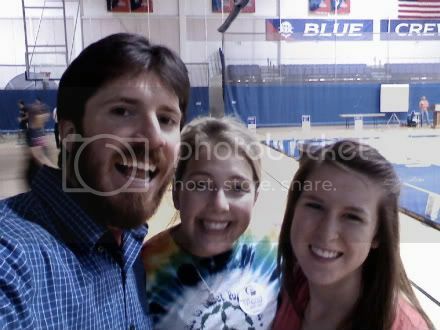 The event organizer was really nice and cheery, and didn’t look a day out of high school. I knew that the Relay for Life was a walk, but it never occurred to me that the majority of the “audience” would be walking, while I performed. I just assumed that no one would hire a comedian to perform for people who are walking. It’s never good to assume though – I learned this in grade school. She initially asked me to perform at a podium, which was directly in the path of the walkers. Not wanting to be high maintenance, I asked, “Do you think that’s the best spot? Given that people will have to walk around me?” She then reconsidered, and asked me to perform center court, in the middle of the walking circle. Mmkay. I was to follow a dance team, also not good, but I hadn’t given up. My plan was to find a way to make it work. My introduction didn’t help matters. I had been asked to email my intro a week in advance, so given all of that lead time, I thought they were really gonna nail it. The DJ cut off the Beyonce and introduced me (without pointing out to the students that this next portion of the event would be comedy). Mmkay, thanks DJ. Preciate you taking the time to memorize the ten word intro. Also, “whatever that means”? Really DJ? It means that I just came from the Detroit Comedy Festival, like it says. Anywho, the problem with the intro wasn’t so much the poor delivery, but the fact that no one heard it, and thus no one was aware that comedy was about to happen. But happen it did! 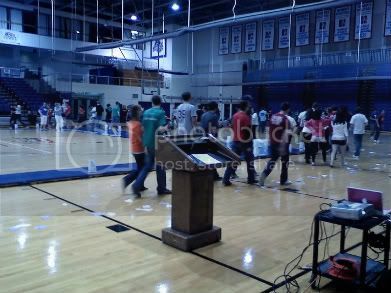 Unfortunately, as I walked on to the “stage” a game of beach volleyball had drifted on to center court. So I walked through a line of walkers, and into a game of volleyball. There were some smattered cheers of recognition that American was indeed their University, but no one was looking at me. They were all walking and talking, understandably. I still hadn’t given up on the situation, because I have a bit about the “walk it out” song by DJ Unk, that would clearly fit this situation perfectly. But as I went into my bit about “walking it out”, a beach volleyball hit me, and a young man said, “Oh, sorry man!” Meanwhile, a game of pick up basketball had formed at the far end of the court. I never thought I would have to perform on a basketball court, while basketball was being played. I looked around for the event organizer, to see if she was going to ask the athletes to cut back, or if she might call an audible on the whole comedy thing, but she was nowhere to be found. Now, if you ever do a “hell gig,” the main objective for the comic, is to get through the allotted time you were contracted to do – that way, no matter how bad it goes, at least you did everything in your power to do your job, and contractually get paid. Unfortunately, I had agreed in the email to 30 minutes. Thirty minutes posed a problem, given that after 45 seconds, I was out of material that might work. So I did color commentary on the volleyball (not because I thought it would dig me out of any hole, but because it was the only thing I could think to talk about, given it was what was happening, in my space). The game wasn’t so much “beach volleyball,” as a game then involved keeping a beach volleyball in the air, for as long as possible, that they were calling “keep it up.” I refrained from making the obvious joke about “keeping it up” with a bunch of dudes, given I had also signed up to do a clean show. I then I walked around with the students interviewing them as they walked. 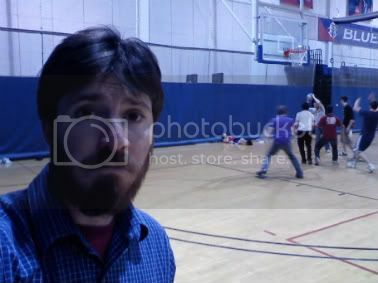 The students talked about facebook, and what major their parents wanted them to take, and the American loss to Villanova the day before, and the fact remained that none of the students knew why I was walking around the middle of the basketball court with a microphone. Twelve minutes into my “set”, the DJ said, “hey you wanna just play some more music?” I was like, “Sounds good to me!” So I spent the last eighteen minutes of my set, taking pictures from my cell phone. (below)Here I am, while people walk by me, not noticing me. In the back, you will see the volleyball game center “stage” that involves keeping a beach volleyball in the air for as long as possible. 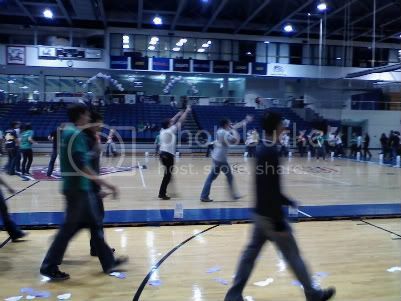 (below)Here I am on the far side of the stage, where a pick up game of basketball had formed. (below) Here is the podium where I was asked to perform, before they agreed maybe it wouldn’t be a great idea to perform where the line was passing…though in retrospect, given the volleyball, this spot would in fact have been better. (below)This picture was taken shortly after my set, when the DJ played “Backstreet’s Back.” Two nice young gentlemen came up to me and asked if they could borrow my microphone, to sing along. This is a picture of them, singing along to Backstreet Boys. (below)Here is me with two of my “fans” immediately following my “set.” By fans, I mean two girls who had no idea who I was, or why they were taking a picture with me. 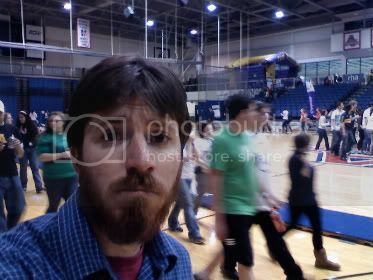 (below) Here is me, 20 minutes after my set, right before they turned out the lights for Sarah Mclachlan’s “I will remember you.” I am sad here, partly because the song is sad, and partly because I couldn’t find the event organizer to see if I was going to get paid. This song had special significance to everyone in the room who had lost a loved one, and special significance to me because I knew that I would remember American, but they would not remember me.